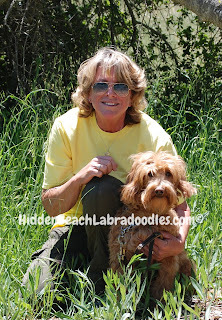 Welcome to Hidden Beach Australian Labradoodles! We are centrally located on the California coast, just west of Silicon Valley. All our puppies are born in our home, where they are loved, held and socialized until the time comes for them to join their forever families. Thanks for visiting! I have a wonderful husband and we share five beautiful children, and four wonderful grandchildren. I am truly blessed. I have always been an animal lover. I was very lucky to have grown up surrounded by dogs, cats, chickens, and horses. My love for animals has never wavered. I have carried on the tradition with dogs, cats and bunnies, in my children’s lives. To my dismay, my child developed allergies to animals. We discovered Cockapoos. They are asthma/ allergy friendly. We could have a dog in the house. It was liberating. I thought of all of the other children that would love to have a dog and my passion took flight. My children are grown and the natural progression for me seemed to be puppies. I love them dearly and like I said, I have a wonderful husband. In my wildest dreams, I do not think I could have imagined how much love and satisfaction I would feel when there are puppies in the house. I cherish each and every one of them. I have been breeding Cockapoos long enough to think of myself as an accomplished breeder. I am the highest rated breeder in the Cockapoo Club of America. I have always maintained the highest standards and I strive to breed the strongest lines possible for healthy, happy pups. My puppies are born in the house, where they stay until they join their forever families. At four weeks of age, the puppies are moved to the living room, where they are exposed to all the day to day activities in our home. Each puppy has one on one time with me daily. This is a full time job. At my house, they are paper trained. I can tell you that this skill does not always transfer with them to their new homes. We have a great track record, but it is not 100%. I only have two breeding females. And, I only breed them once a year for a total of three times. These dogs are our beloved pets and will remain with us all of their lives. Once again I have made a transition. I am the proud owner of a Multi-generational Australian Labradoodle. It seemed a natural transition because she carries all of the same wonderful traits as my Cockapoos. She is allergy friendly, with no "doggy fragrance" and we do not notice any shedding. Stella is my dog, and she rules my heart. She is beautiful, with a silky red fleece coat. She is not just a pretty face. She is smart. I have become a trainer and she has become an Iron Dog. Stella is trained off leash to respond to both voice and hand commands. She is also proficient in agility. The other side of Stella loves to cuddle and play. She loves the beach and she loves her nap. That’s my girl.